3 International Bestselling Mystery Novels. Bone-chilling tales from a Bestselling Author. Sold in more than 200.000 copies! ITSY BITSY SPIDER (Emma Frost #1): Emma Frost inherits a house on Fanoe Island when her grandmother dies. She decides to move there with her family, much to her teenage-daughter's regret. One morning a wealthy old woman in her street is found murdered and soon Emma finds herself wrapped in a mystery uncovering the island's dark secrets that not only runs deep within the history of the island but also within her own family. MISS POLLY HAD A DOLLY (Emma Frost #2): Miss Polly had a dolly. A beautiful daughter that she called her Baby Doll. Every day she dressed her in dresses and brushed her hair before they went outside to show off to the neighbors. On the playground one day her Baby Doll talked to a boy, and for one unforgivable second, Miss Polly let herself be distracted by a woman telling her how adorable she thought her daughter was. When Miss Polly finally turned to look for her Baby Doll, she was gone. RUN, RUN AS FAST AS YOU CAN is a spine-chilling Scandinavian mystery. 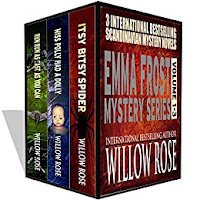 It is the third book in Willow Rose's bestselling Emma Frost series. The fourth book Cross your heart and hope to die is still in the making and hopefully it will be out in the beginning of 2014.